I’m pretty sure that, in at least one way, I am like you: I enjoy trading the markets. I take pleasure in picking investments through research and most especially, I am keen on taking profits. I may or may not be like you in that I am strictly a position trader. You’ll never find me glued to the ticker, anxiously awaiting the signal to capture a quick profit. For me, that would be a monumental waste of precious time and an invitation to donate my resources to the other side of the market. Several of my friends and colleagues (and a great many CSI subscribers) take a different approach, however, relishing the process and the profits of day trading. If you’re satisfied with both your income and the pleasure derived from your trading activities, then you might prefer to skip this article and get back to trading. It is intended for traders who are unfulfilled either in profitability or enjoyment. It aims to help you decide whether position trading or day trading is right for you and includes tips to improve success using either investment style. There is undoubtedly merit in both position trading and day trading, provided the chosen approach suits your temperament, and the unique advantages and pitfalls of each approach are understood. Let’s start with a little comparing and contrasting: Just about anyone would agree that you can lose your money faster day trading. You can make money faster, too. Call that a draw. Are there other aspects of trading, such as expenses and analysis techniques that differ based on trade duration? My staff and I looked into noteworthy aspects of day trading and long- or intermediate-term trading that affect your bottom line. I’m sharing our findings here. Because I rarely enter a market with a hasty exit in mind and because CSI happens to offer an end-of-day service, we had some concern that unintended biases might creep into this report. That having been said, please know that we tried to be absolutely objective. This was by no means a scientific evaluation, but more a compilation of ideas gleaned from magazine articles, books, websites and personal experiences in an attempt to show what works for users of both trading styles. It is clear that fixed costs are greater for day traders, who typically sign on for expensive real-time update services, often with costly analysis software and advisory reports. Monthly software fees can also significantly add to the costs of intraday trading. Consider an example of how your “profits” might be eaten up over the course of a month while making multiple daily trades: So-called all-in-one firms earn substantial revenue from intraday traders through commissions, monthly fees and software upgrade fees. Because of limited data resources, and in the absence of many necessary tools such as offered by CSI, their customers may also incur outside fees for software, data, market indicators and recommendations. The cost of executing trades has a much greater significance for day traders than for position traders because day traders make more trades. Therefore, the quality of fills gains heightened importance for day traders. Any time there is a formidable bid/ask spread, you are probably considering an illiquid market and may be paying too much. Did you know that the New York Stock Exchange offers the best price to traders 90% of the time? (1) This is why many brokerage firms use only the exchange and eschew "market makers" who provide the same service, but with typically worse fills for their clients. Because stock limit orders are usually invisible to the market, small traders are forced to accept the best price the brokerage firm is willing to get them. In practice, this is often a market maker’s bid or ask, which may represent a wider range than the bid-ask spread available through the exchange. The day trader who is continually paying the bid-ask spread does a lot to boost market makers’ profits. Most market makers appear to kick back a nominal amount to the broker or vendor who supplies the order. The broker is obligated to disclose these relationships, plus payment terms and the percentage of order flow going to each. Be sure to read the fine print to find out where your money is going. The spread between the bid and ask (slippage) can be significant. 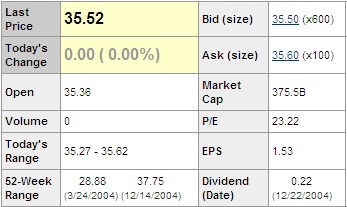 In this example from a brokerage website, it is ten cents per share. The quality of fills gains heightened importance for day traders. Any time there is a formidable bid/ask spread, you are probably considering an illiquid market and may be paying too much. The availability of quality analysis tools is an important variable that, in general, gives an advantage to position traders. This is because position traders are likely to use long-term technical analysis in conjunction with fundamentals for evaluating trading opportunities. This contrasts to intraday systems that rely on very short-term technical signals that reverse themselves time and time again over the course of the day. From my own experience, and with the support of many analysts, market fundamentals are key to determining what is and what isn’t a good trade. Does this mean that day traders can’t use fundamentals? Absolutely not! Day traders are not required to disregard longer-term trends and fundamentals. I daresay many of the CSI customers who are day traders have made the connection between long-term analysis and intraday profits. Those day traders who rely solely on tick-by-tick systems are adversely affected by limiting the scope of their analysis. Whether trades are signaled by technical indicators, pure fundamentals or hunches, and whether they are executed on a short-term (near real time) or end-of-day (position) basis, the best results come when trades are in the direction suggested by reliable fundamentals. For any trading style, you will usually get a better ride by first doing your homework. The homework amounts to using fundamentals to determine the expected directional movement of related markets in general and of the traded market in particular. Once this is known, you can improve your odds greatly by trading in the direction suggested by the fundamentals. Many of these fundamentals are readily available from the Unfair Advantage® platform, so they are accessible by all CSI subscribers at no extra charge. Access to some of the information requires a visit to the CSI website. There you will find key statistical offerings provided only to our customers. 1) Heavy volume or open interest in any market very often leads to further movement in the same direction. The CSI database holds daily price, volume and open interest data on every world futures market and most popular stocks and options. Use these vast data resources to learn about all things financial. Tip #1 - As you can see in this chart, heavy volume or open interest in a market often leads to further movement in the same direction. Note the price movement on days with tall volume bars. Price movement on the subsequent trading day nearly always follows through in the same direction. 2) - Increasing put/call ratios of the corresponding tradeable vastly increases confidence that a move will be sustained. CSI offers all world futures options and all stock index options. This very important and rare database makes CSI customers uniquely capable of analyzing put/call ratios. 3) - Strong moves in markets that are negatively correlated to the market you’ll be trading strongly suggest movement in the opposite direction for your market. As any regular CSI website visitor knows for sure, you can get an immediate list of all stocks and/or all world futures markets that correlate positively and negatively with the given market you have chosen to trade. Such information will become invaluable in deciding the likely directional movement of a given market. When using the website correlation tables, there is no need to match up stocks with stocks or futures with futures. Your tradable market of interest may be paired with any market regardless of type. 4) - The level of correlation displayed is provided as a positive or negative quantity which ranges from minus 1.000 to plus 1.000. This is a statistical quantity and it happens to be a highly useful measure of association between the market you plan to trade and any other correlated market that suggests some significant causal influence. Tip #4 - Markets that are positively correlated with the market you plan to trade have sustaining directional effects on your market when the independent, correlated market leads your market. 5) - If a correlated market is expressed as a foreign currency, be sure to convert the underlying currency to the currency of your market before evaluation. This is something you won’t find in most competitors’ software. 6) - Be aware that some commodities and futures exhibit tendencies to be “forward markets” or “backward markets.” In forward markets, distant contracts have higher values than near contracts. The reverse is true for backward markets. Use this knowledge to your advantage. 8) - Introduce as much daily historical evidence as is made available through Unfair Advantage (over 50 years in the case of the CBT corn market) and factor in all available history through the current date before making a judgment on the future directional movement of the proposed market. The lengthy historical period will help you to prove your theories before you launch your trade. 9) - Commitments of Traders (COT) data is among the fundamental facts you should consider before making a trading decision. CSI provides the full history of all important trader information on regulated commodities through the Commodity Futures Trading Commission (CFTC) report on the weekly USDA’s C.O.T. report. This data, available to CSI subscribers, identifies the breakdown by open interest category of Large Traders, Small Traders, and Commercial traders. This invaluable resource provides a directional forecast of price movement for the most basic products to the U.S. economy. It is usually unwise to take a position in the market that is contrary to a unified commercial hedging position, as visible with the COT Index, but exceptions could occur. The broad directional coverage supplied should be consulted before any futures position or any related stock position is taken. Tip #9 - Commitments of Traders (COT) data identifies the breakdown by open interest category of Large Traders, Small Traders, and Commercial traders, revealing the outlook as interpreted by insiders and professionals. Commercial interests often lead the market. COT data is provided by publisher Steve Briese (www.InsiderCapital.com) in a modified form through The Bullish Review. Mr. Briese accepts subscriptions to his analysis of these numbers and related factors. 10) - Most markets have their complements. Live Cattle, for example, should be studied on the basis of Live Cattle options, the C.O.T. preferences over time, the put/call ratio of Live Cattle Options which measure immediate strength, the Canadian Dollar, which correlates negatively with Live Cattle, Feeder Cattle, which correlates positively with Live Cattle, and Feed Wheat, which correlates negatively with Live Cattle. You should also compare contract delivery months against each other. Don’t forget to study the cash market as well. 11) - The seasonality of any related market’s price behavior is another factor that should be considered before taking a position. CSI’s seasonality study is a remarkable forward-looking tool that projects the behavior of any market into the future. Every market traded in every futures exchange on earth is covered through this dynamic seasonal study for the full period of historical resources reaching backward in time for decades. In all proposed trading opportunities, UA’s seasonal study is a “must check” input. 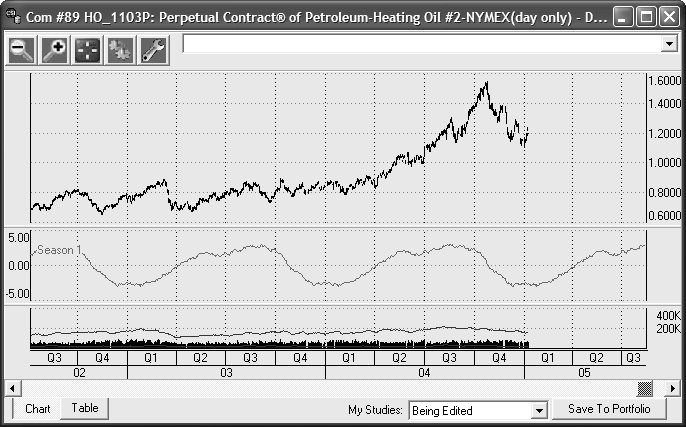 Tip #11 - This two and 1/2 year chart of Perpetual Contract data for Heating Oil shows market movement (above) and the seasonal waveform below. The positive projection for the coming year is displayed in standard deviation units at the right side of the chart. 12) - Use filtering tools. CSI’s MarketScanner module (within the UA product) can be used by position traders or day traders to isolate stocks that have similar technical characteristics or stocks that exhibit desired fundamental properties. You can scan and view all futures, all stocks, all stocks of a particular exchange or just the content of your portfolio(s). The scanner provides access to many categories of fundamental data and allows you to filter, sort and rank by fundamental and/or technical values. Use MarketScanner to look over and evaluate the field of possibilities before taking on any position. You’ll be glad you took advantage of this capable product which is FREE to every Unfair Advantage subscriber. Tip #12 - The above graphic shows MarketScanner and a sampling of studies and indicators available for filtering and sorting. Use all of the above to learn how to trade from decades or at least a dozen years of past history. Then put everything together into a single package, and you should have a great chance to prevail with whatever approach you choose. All this talk about fundamentals, which are, by their very nature, long-term indicators, might be alienating the day traders among us. I hope not, because day traders can benefit from studying fundamentals as much, if not more, than position traders. By knowing the fundamental elements affecting your market, you can be prepared to confidently enter short-term trades that are technically indicated and supported by the fundamentals. You can then either disregard or exercise great caution when acting upon technical signals that contradict the fundamentals. The fundamentals act as a compass pointing the general direction your market will go. Your short-term technical signals can then guide you through the labyrinth of fluctuations along the way. Another MarketScanner chart, this one showing the results of three candidate studies. Each of the included studies can be used for screening potential investments. As I was contemplating this paper, I received a Christmas present which, to my surprise, reinforced and confirmed the points being made today. The gift was the game “StakXChange,” which is a Monopoly-like board game that mixes technical and fundamental properties to guide you to profits in a make-believe futures market exercise. Each player can take on a purely technical perspective or can combine technical indicators and fundamentals to anticipate future price moves in an orderly and efficient manner. As your piece moves around the board, you can take your signals from built-in moving averages, a relative strength index, a stochastic index, or from any number of chart formations, etc. You are also made aware of related movements in silver and gold, and other precious metals as you attempt to predict future market direction in a given market. The winner is usually the player who capitalizes on the most information. Just like real life! The game caught my eye more for its authenticity than for the fun of playing. The developers (Momentum4Fun, Inc.) showed a great deal of insight when they put this award-winning game together. It turns out to be a learning tool for even the seasoned trader who might benefit from contemplating more than just the price of a product over time. In conclusion, despite my own dislike for watching tickers and personal preference for a laid-back approach, it is clear that many traders love the excitement of scalping the markets and derive great satisfaction from being actively involved in their investments. The essence of our findings is that success can be found in trades of any duration. Differences in profitability seem to come not from the length of your trade, but from the wisdom of the given position and from the expenses incurred. Although I am still sold on position trading, I do not discourage real time or intraday traders. However, I believe that short-term and long-term market direction should always be based upon the longer term trends and conditions that are only evident from a market’s association to statistically related markets and conditions. Day trading and position trading share a great deal in common, most notably that fundamentals can help improve trades of any duration. The added insight provided by fundamental data, which is inherently long-term, can deliver substantive benefits for both day traders and position traders. Admittedly, a bit of work is required to get to a point where you can incorporate fundamentals into your trading routine, but with patience and perseverance, you should have something that will win, and win and win for years to come. The content of this article is for information only. Neither the author, editor nor CSI makes or has made any recommendation regarding the purchase or sale of any futures contract, security or other investment vehicle. Substantial risks are inherent in any trading exercise. Please seek the advice of trusted investment and tax professionals regarding the evaluation of any specific trade. Each month in this column the CSI Technical Support Staff addresses issues of interest to many CSI subscribers. This month they discuss several aspects of using the Unfair Advantage factsheets. Topics include interpreting trading month descriptions, expanding column descriptions, locating time series within the factsheets, accessing early market data, and a listing of stock fundamental data found within the factsheets. Q. When I view the Factsheets provided with Unfair Advantage, I notice that the “Active Months” column for commodities includes a cryptic set of “I”s and “V”s. What do these mean? A. Each commodity has a corresponding 12-letter set of symbols that represent calendar months. The first letter represents January; the second represents February, etc. Each month is identified as “V” for valid trading month, “I” for invalid month or “S” for switching month. Switching months are very lightly traded, short-term contracts that fall between normal contracts. They are not available for most commodities. CBT Corn is a good example. Its Active Months are listed as: SIVIVIVIVISV. This indicates that January and November are switching months, February, April, June, August and October are invalid months, and March, May, July, September and December are normal, valid trading months. Q. I can’t make out all the headings on the Unfair Advantage factsheets because the columns are very narrow. How can I see the full descriptions? A. The factsheets come to you in a very condensed form so that all the information can be displayed at once. Once you learn the meaning of each column, you’ll probably prefer this condensed presentation. While learning, the easiest way to see the full heading name of any column is to double-click it. The column width will adjust to fit the heading, not the column data. As you expand more headings, the spreadsheet will expand horizontally. You can then use the scroll bar at the bottom of the table to view the full factsheet. To restore the table to its original presentation, right-click your mouse and then click the “Reset Column Width and Placement” button. Q. I’m trying to track the economic and Commitments of Traders (COT) data you recommend following, but I can’t find them in Unfair Advantage. Where are they? A. These are listed in the “All Cash/Forward/Fundamentals” category. You can find this list by clicking the arrow next to the box labeled “Limit to Market Type,” which is on the main Factsheet screen and on the “Select Data” screen when selecting a market to chart or adding to your portfolio. The drop-down menu offers 25 different data categories. A few other categories you might have trouble finding are: Domestic Stock Indices, Foreign Exchange Rates, Interest Rates, Narrow-Based Index Futures, Futures with options and Stocks with options. Find these and more on the Market Type menu. Q. I’m interested in analyzing the earliest historical data CSI has to offer. How can I find the start dates of the earliest series in my database? A. The start dates of all series in the CSI database can be found in the Factsheets. As mentioned above, the data is sorted into different categories, so you’ll need to view a couple of different categories to see everything. Start with “All Stocks and Mutual Funds,” then check “All Futures Markets.” In both listings, click the “Start Date” heading to sort by that field. The stock list will begin with the Dow Jones Transportation Index (1928). The futures list will start with Dow Jones Indexes (1928), followed by Corn and Oats (1949). Access to this early data is not included in a basic CSI subscription, but you may purchase it for $10 per year per market category. Contact CSI marketing to make arrangements. Q. Which stock fundamentals are available within Unfair Advantage for market analysis? A. The Unfair Advantage stock factsheets include the following fundamentals: Sector and industry codes, Earnings, Shares Outstanding, Number and Percentage of Institutional Shareholders, Stock Beta, Five-Year Revenue and Dividend Growth, Dividend Yield, Latest Annual Net Income, Price/Earnings Ratio and Latest Annual Operating Revenue. You can use any of these as sort and/or filtering keys within UA’s MarketScanner module. Note that Fundamental Data series are available for about 7,500 of the 12,000 stocks in the CSI database, including virtually all popular high-volume stocks. CSI strives to report the Trader's Alert Calendar for world futures and commodity markets shortly after the 1st day of each month. It includes the first notice day, the last trading day and other alerts that are relevant for the current month. Beginning with the March 2005 issue, the CSI Technical Journal will be posted on the CSI website (www.csidata.com) when it becomes available for review. Printed newsletters will be mailed on a very temporary basis to those requesting this service. Monday, February 21 is the U.S. Presidents Day holiday. Many U.S. Exchanges will be closed, but CSI will be open for business as usual. Notice: The views and information expressed in this document reflect the opinions and experience of the author Robert C. Pelletier. Neither CSI nor the author undertake or intend to provide tax advice or trading advice in any market or endorse any outside individual or firm. All recommendations are provided for their informational value only. Readers should consult competent financial advisors or outside counsel before making any software purchase or investment decision. CSI does not stand behind or endorse the products of any outside firms. Website Links: This CSI website and Unfair Advantage system contain hyperlinks and automatic links to websites operated by parties other than CSI. No association with or endorsement of third-party websites should be inferred through these links. They are provided for your convenience and reference only. CSI is not responsible for and has no control over the content of third-party websites. All information and data on this website are © Copyright 2002-2005 by Commodity Systems Inc.(CSI) All rights are reserved.